We’ve always suspected that dogs are smarter than humans. Now we have proof. In a video posted to YouTube by a Russian-speaking user, we see what looks like an anonymous street that could be in any ex-Soviet country. The video is set (for no apparent reason) to the song “Don’t Let Me Down” by The Chainsmokers. Out of the left corner of the video, a man crosses the road while the crosswalk sign shows a ‘Do Not Walk’ light. Clearly, this man has no qualms putting his life in danger and breaking the law by jaywalking. A dog on the right hand side of the video thinks otherwise. He/she understands that societies are built around laws and those laws are meaningless if we don’t obey them. The dog therefore patiently waits for the light to turn green and then crosses the road. What makes this dog even smarter than it might initially seem is that dogs can’t tell the difference between red and green colors. That only leaves two possibilities for how the dog differentiated the walk and do-not-walk lights: either the dog recognizes the shapes or it knows that the top light means ‘don’t walk’ and the bottom light means ‘walk.’ Either way, that dog is one smart cookie. 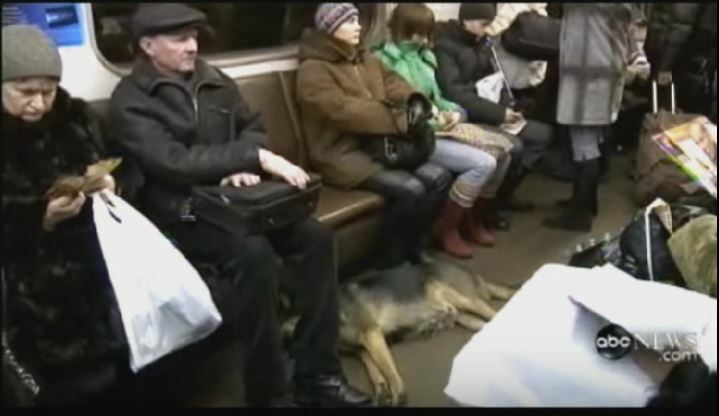 In case you think this is a one off incident, you’d be surprised to find out that dogs have even mastered the art of riding the subway in Moscow. According to an ABC report, some of the 35,000 stray dogs in Moscow have learned that commuting like humans pays when it comes to scrounging for food. The dogs regularly ride the subway to get around the city and no one bats an eye as they lounge on the floor of subway cars during peak hours. One Russian biologist, Dr. Andrei Poyarkov, probably put it right: “In Moscow, there are all sorts of stray dogs, but there are no stupid dogs.” If these subway-riding, traffic light-obeying canines are any indication, then we’re inclined to agree. If only humans could take a page from these well-behaved Russian dogs, maybe we’d be living in a much more decent society. We wouldn’t count on it though.